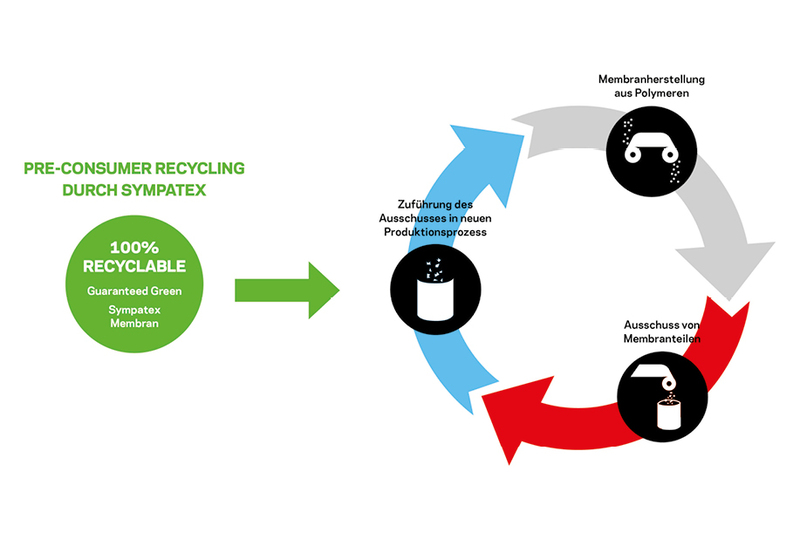 Sympatex - Recycling - Your partner for innovative functional textiles. While in terms of sustainability the manufacturing process is often the centre of attention, it has become clear that also waste disposal increasingly entails ecological consequences and highly jeopardises our own living space. Due to the fact that clothing is often exported to third countries for final usage without hardly any controlled disposal, our industry also plays a major role in polluting the air, seas and areas in the long run because of unfiltered combustion gases or uncontrolled landfills. Therefore, we aim at completely closing the textile loop and make an effort step by step so that textile waste becomes a resource for our own industry again. We have already proven in the area of clothing as well as shoes that partial or even complete recycling is already possible from a technological point of view as far as already considered when the materials are selected. The Sympatex membrane is an ideal starting material thanks to its recycling capability. In order to provide the respective logistics, we have founded the consortium wear2wear together with large industrial partners which welcomes all like-minded partners and aims at collecting and recycling textiles. Facing 25 billion pairs of shoes annually and 1,5 million tons of disposed textiles in Germany alone, this might be a small first step – but it represents a working foundation for a future in which we will meet our overall responsibility as an industry. When properly taken care of, products manufactured with Sympatex laminates have very long life cycles. 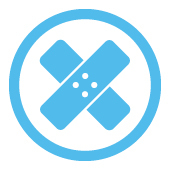 In addition, Sympatex works together with selected partners to offer professional repair services to remedy damage caused by use, thus ensuring the wearer can enjoy the garment for many years. Depending on the field of application (outdoor, athleisure, skiing or workwear) and design, the manufacturing partner uses a suitable membrane from Sympatex for the laminate. Apart from the 100-percent water- and windproof and breathable material, the compact hydrophilic Sympatex membrane has an elasticity of up to 300 percent. Even with regular use, it never forfeits its functionality and stability. Another plus is that because the Sympatex membrane is non-porous, it doesn’t clog due to residues from washing detergents or other substances such as creams or perspiration. On the contrary, products with Sympatex membranes reach their maximum breathability after one to two 40°C washing cycles. Furthermore, Sympatex membranes and laminates, as well as certified Sympatex partner products, undergo extensive testing before they are used by our brand partners. Apart from waterproof, windproof and breathability testing, the materials are also inspected for abrasion resistance (important when carrying a backpack for instance) and durability. Click here for further information about the comprehensive testing methods used by Sympatex. 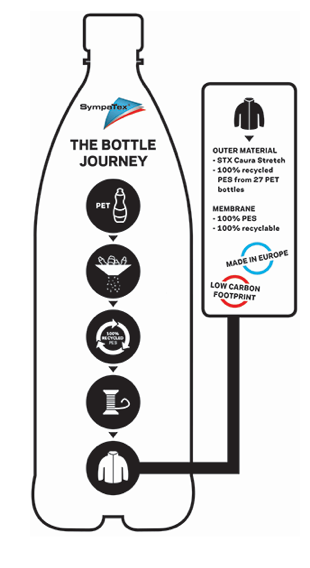 The Sympatex membrane can be recycled following standard methods – just like PET bottles. Regarding the production of the membrane, Sympatex and its partners have developed a procedure for the first time that helps to reduce the material input quantities by up to 15%. The material and the energy savings are achieved by a mono-material recycling of waste membrane particles that were created during the production and that had to be disposed of before. During the development of this procedure, Sympatex managed to essentially guarantee the product properties of the highly functional membrane at the same level without any loss of quality. The pre-consumer recycling procedure has been used since the beginning of 2011 for a selection of Sympatex membrane qualities and represents an important step towards an improvement of the eco-balance. At the beginning of 2017, Sympatex has committed itself to using more and more recycled polyester for its uppers and lining materials as part of its “Agenda 2020”. The advantage: if you laminate the Sympatex membrane made of pure polyether/ester with recycled polyester uppers and liners, you will get pure laminates that can easily be added to the closed textile loop at the end of their product life cycle. The material basis of these fabrics is a yarn that is produced with recycled PET bottles. Sympatex cooperates with the Italian yarn specialist SINTERAMA S.P.A., whose trademark “New Life” is certified according to the internationally renowned “Global Recycle Standard”. The “New Life” yarns are made by using recycled PET bottles that are collected and processed in northern Italy. 100% “made in Italy” and 100% transparent. The applied recycling process is a mechanical process without the addition of polluting chemicals. Increasing awareness of sustainable materials and a growing worldwide need in the textile sector support the positive global aspects of this ecological progress. The conclusion: reduce, re-use, recycle – the environment will be grateful. 94% less water consumption = only around 3 litres instead of 60 litres water! As a logical consequence and vital next step, Sympatex aims at recycling the recyclable membranes and laminates that are used for the piece of clothing – thus enabling a closed loop. Sympatex strives for recycling the homogeneous pieces of clothing in the recycling process resulting in high-quality granular material – briefly: upcycling the product. wear2wear makes this possible – an innovative industrial partnership for high-quality and simultaneously sustainable clothing. Damaged functional clothing need not be thrown away. In line with sustainability and durability, tears and holes can be sealed with the correct materials and the know-how of our “Repair Partners”. Broken zips, torn-out pockets or sleeves that are too long are not a problem either. Check out our authorised “Repair Partners”.